Digital Birmingham is excited to launch its grant funded Big Data Corridor (BDC) programme in conjunction with the European Development Fund and partner organisations Aston University, Birmingham City University, Enable iD, Innovation Birmingham, Telensa and Transport West Midlands. 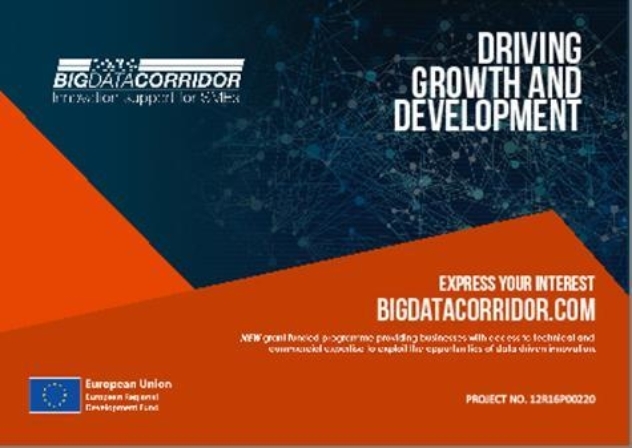 Small to Medium sized enterprises (SMEs) have a unique opportunity to be a part of the Big Data Corridor programme benefiting from access to expert technical and commercial support exploiting the opportunities of data driven innovation. Tech UK predicts that there will be £241m in UK economic growth by 2020 with the creation of 157,000 new jobs because of Big Data. This unique opportunity gives businesses in the Greater Birmingham and Solihull area a competitive edge and accelerates their capabilities in the use of data so increasing their market share in the growing global data economy. Big Data: little or no experience? SMEs can receive support to develop their knowledge and skills and learn how to use data to the advantage of their company. Big Data: already know what you are doing? SMEs have the fantastic chance to receive technical expertise and business advice to accelerate their product development and/or business plans. Big Data Corridor offers a range of support through individually tailored programme unique to each SME depending on their requirements. There will be workshops, networking and mentoring opportunities to help businesses better understand data capture and management, the use of sensor technologies and data commercialisation. An online data platform will be available to experiment with data and provide resources for new product development.